Do you need a quick informative price calculation for concrete incl. transport? Then use our Concrete Calculator according to the below mentioned steps! Enter the address of your construction site, i.e. the street and town (e.g. 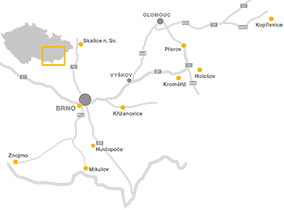 Slovanské náměstí, Brno). If the blue disc does not appear at the point of your construction site, drag & drop it to the right position. Choose the class of concrete from the list and enter the amount (e.g. according to your design documents). Price of concrete incl. transport for amounts smaller than 4 m3 by the sales representative. The price of concrete is for the S3 consistency and the Dmax aggregate according to the valid price list of each concrete plant in the category of concrete with strength after 28 days. The Concrete Calculator only serves for informative pricing of concrete incl. transport. Prices of concrete include the retail discount. The Concrete Calculator is limited by the distance between the construction site and the respective concrete plant being 35 km at the most. The prices do not include VAT which will be charged in the legally set amount. Information of the possibility to apply the decreased VAT level may be provided by the respective commercial and operation manager. The transport price is charged according to actually transported quantity, but not less than the minimum loading of 4 m³ for trucks with a capacity of < 7 m³ and for trucks with capacity ≥ 7 m³ a minimum loading of 6 m³ is charged. TRANSBETON Ltd. reserves the right to change the prices. The Concrete Calculator is the property of TRANSBETON Ltd., CRN (IČO): 25597205.